Data Virtualization (Teiid) provides Architects, Database Administrators and Developers the ability to build Data Services with federated and aggregated views of data with ease. DV gives them a fast, easy and agile experience in Data Integration. Instead of building connections to individual data sources and transformations for a aggregated view, Developers can use DV for creating Data Abstraction Layers for Data Integration and then utilize many different interfaces for consuming the data. We have created a simple way for Developers to quickly view the product and view/run a simple project. This gives them a Hello World experience. 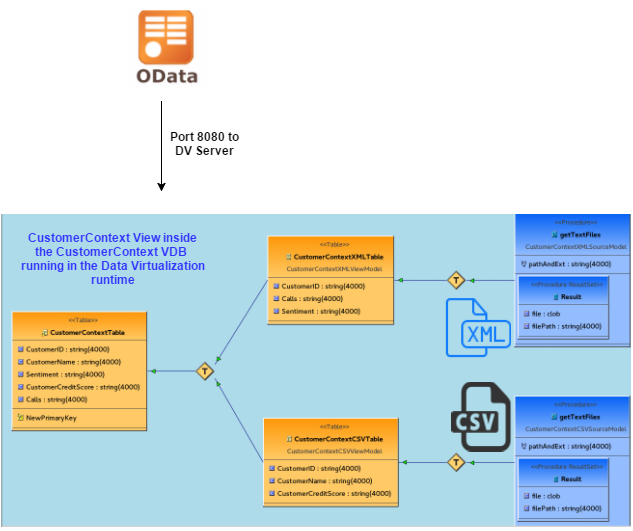 The Getting Started example revolves around a Customer Context with data from a XML file and a CSV file. The repository has all the instructions to install DV and JBDS, import the project, view data from the views, deploy the Virtual Database and browse to the data. Scripts are also included to automatically install and run DV then test OData urls. This provides the ability to use 1 of 3 options - Option 1 with JBDS and Option 2 without JBDS. Copy Dockerfile and .dockerignore files from support/docker directory to the project root. docker build -t jbossdemocentral/dv-gettingstarted . -View the out.txt to see All Data, Specific Entity and Metadata examples for XML format and/or run the three below individually through the Chrome browser. The EMEA Partner conference is October 4th to October 7th, 2015 in Frankfurt at the Congress Center Messe Frankfurt. Data Virtualization is included in 2 presentations and 1 lab. Abstract: Hortonworks Data Platform (HDP) with Red Hat JBoss Data Virtualization (DV) integrates Hadoop with existing information sources including data warehouses, SQL databases and enterprise applications. The solution creates business-friendly, reusable and virtual data models with unified views by combining and transforming data from multiple sources including Hadoop so developers and business analysts can build new applications that exploit new data sets. In this session we will discuss HDP and DV integration and show a real world example of Big Data with DV. DV will leverage HDP to mashup Clickstream analysis data with product and customer data on HDP to provide Virtual Data Marts to Marketing and Product Teams for multi-departmental teams. The Red Hat Partner Conference agenda has a variety session types including keynotes, breakout tracks, Labs Unlimited, examination and more. Gain insights from Red Hat and partner executives. Breakout sessions are 40 minute presentations by subject-matter experts focused on a particular topic. Get your existing sales accreditation extended by participating in defined sessions. The defined sessions will be published here. Over 35 labs, both instructor-led courses (see daily agenda for details) and self paced test labs (ongoing in Spektrum I). 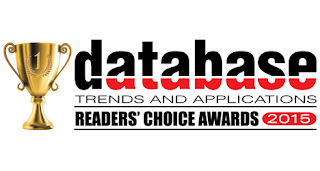 We are very excited to announce that both JBoss Data Virtualization and JBoss Data Grid were finalist in the Database Trends and Applications (DBTA) Readers Choice Awards for 2015. 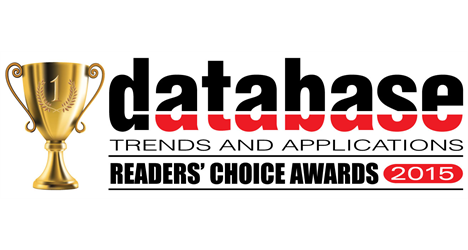 JBoss Data Grid was a Finalist in the category, Best In-Memory Database. JBoss Data Virtualization was a Finalist in the category, Best Data Virtualization Solution. There were 29 categories in which products could be nominated and ultimately voted upon. The categories were wide-ranging for the Data Industry. For instance, there are Hadoop distributions, NoSQL database products, and cloud products and services, but also categories to recognize products in more established segments of the market such as relational database management, MultiValue, business intelligence, and data integration. Consume provides Data Abstraction which is the reduction of a particular set of data to a simplified or essential elements of data. The main concepts bring us to the overall goal of JDV from DBTA which is to achieve a complete view of enterprise data across disparate data environments. As businesses are increasingly using a wide range of technologies for structured and unstructured data that is located across systems there is a risk of moving further from the main goal. But using JBoss Data Virtualization reduces or removes this risk since data from across the enterprise can be abstracted into the essential data services provided through Virtual Databases (VDBs). The data services gives companies the ability to reduce complexity and improve data analysis. A secondary goal is to to allow organizations a complete data view without having to modify or remove physical systems in place. So to summarize, according to the DBTA, the successful solutions provide agile enterprises agile development, a secure virtual data layer and real-time data access and provisioning. JDG is an in-memory data grid (IMDG) solution that resides entirely in RAM, and is distributed among multiple servers. Recent advances in 64-bit and multi-core systems have made it practical to store terabytes of data completely in RAM, obviating the need for mass storage media such as hard disks. Enhanced performance because data can be written to, and read from, memory much faster than is possible with a hard disk. The data grid can be easily scaled, and upgrades can be easily implemented. A key/value data structure, rather than a relational structure, provides flexibility for application developers. The technical advantages provide business benefits in the form of faster decision making, greater productivity, and improved customer service. Applications that can benefit from IMDG include financial-instrument pricing in banks, shopping carts in e-commerce, user-preference calculations in Web applications, reservation systems in the travel industry, and cloud applications. So to summarize, the successful solutions provide access to data quickly and easily. We have new Data Virtualization (Teiid) images for stickers available which are great for laptop covers, notebook covers, etc. Watch for these stickers across the globe. I usually order the die cut stickers from Sticker Mule. You can access the Sticker Mule Templates here. You can also get the stickers from the JBoss Middleware Business Unit. Just reach out to our Evangelists, Data Virtualization Product Marketing Manager or Data Virtualization Product Manager. One view to query 'em all! Teiid Designer in the JBoss Developer Studio Integration Stack (JBDIS) contains different preferences that allows the Developer to customize their development experience. We will highlight one of the preferences in this article. Teiid Designer is a visual tool that enables rapid, model-driven definition, integration, management and testing of data services without programming using the Data Virtualization (Teiid) runtime framework. Teiid Designer is a part of the JBoss Developer Studio Integration Stack. The JBoss Tools integration stack is a set of Eclipse plugins that add support for JBoss SOA, Data Virtualization and Business rules related frameworks, such as Drools, Teiid, jbpm, SwitchYard, Fuse, etc. 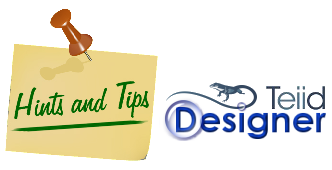 One of the Teiid Designer preferences is the Diagram Settings. One of the settings is the Model Size. Since displaying very large diagrams may take a considerably long time, this preference allows users to set an upper limit on the number of objects to display in a diagram. If this limit is exceeded, a warning message is displayed to the user and the diagram is not constructed. To get to this setting click on Window in the menu and then Preferences. Within the Preferences window, after clicking the Teiid Designer preferences, the preferences will show in the left which include General, Diagram, Editor and Validation settings. After clicking on the Diagram Preferences, the settings window will display. The Model Size default is 20000 and can be changed to a larger value. To find out more about the Teiid Preferences you can take a look at the Product Documentation. To find out more about how to integrate faster with Red Hat JBoss Middleware and Data Virtualization (DV) you can take a look at the DV Product Pages.